This is one issue of People Magazine that you just HAVE to have. 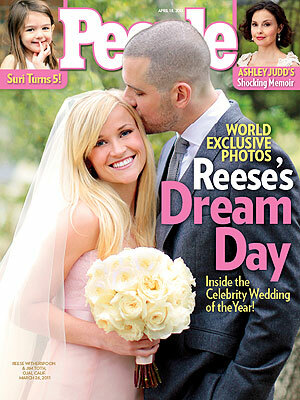 The world exclusive photos from Reese Witherspoon and Jim Toth’s wedding day are inside and let me tell you…. they are gorgeous! I am only revealing the front cover because you need to own this issue! Reese wore a custom-designed Monique Lhuillier blush-hued gown with a Chantilly lace corset bodice and full tulle A-line skirt for the ceremony then changed into a second Lhuillier design, a white silk minidress with a party skirt, for the reception so she could celebrate with ease! “There was a real family feel. There was so much joy in the room and a lot of laughter.” adds another. Last night at the ACMs, Reese was still glowing as she presented with Robert Pattinson. We have one happy bride on our hands. So thrilled for her!